Andropogon sect. Cymbopogon (Spreng.) Steud. Cymbopogon, better known as lemongrass (UK: /ˈlɛmənˌɡrɑːs/; US: /ˈlɛmənˌɡræs/), is a genus of Asian, African, Australian, and tropical island plants in the grass family. Some species (particularly Cymbopogon citratus) are commonly cultivated as culinary and medicinal herbs because of their scent, resembling that of lemons (Citrus limon). Common names include lemon grass, lemongrass, barbed wire grass, silky heads, citronella grass, cha de Dartigalongue, fever grass, tanglad, hierba Luisa, or gavati chaha, amongst many others. 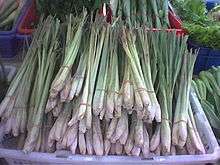 Lemongrass is widely used as a culinary herb in Asian cuisines and also as medicinal herb in India. It has a subtle citrus flavor and can be dried and powdered, or used fresh. It is commonly used in teas, soups, and curries. It is also suitable for use with poultry, fish, beef, and seafood. It is often used as a tea in African countries such as Togo and the Democratic Republic of the Congo and Latin American countries such as Mexico. Lemongrass oil is used as a pesticide and a preservative. Research shows that lemongrass oil has antifungal properties. Despite its ability to repel some insects, such as mosquitoes, its oil is commonly used as a "lure" to attract honey bees. "Lemongrass works conveniently as well as the pheromone created by the honeybee's Nasonov gland, also known as attractant pheromones. Because of this, lemongrass oil can be used as a lure when trapping swarms or attempting to draw the attention of hived bees." Citronella grass (Cymbopogon nardus and Cymbopogon winterianus) grow to about 2 m (6.6 ft) and have magenta-colored base stems. These species are used for the production of citronella oil, which is used in soaps, as an insect repellent (especially mosquitoes) in insect sprays and candles, and in aromatherapy, which is famous in Bintan Island, Indonesia, and the Philippines. Therefore, its origin is assumed to be Indonesia. The principal chemical constituents of citronella, geraniol and citronellol, are antiseptics, hence their use in household disinfectants and soaps. Besides oil production, citronella grass is also used for culinary purposes, as a flavoring. Citronella is usually planted in home gardens to ward off insects such as whitefly adults. Its cultivation enables growing some vegetables (e.g. tomatoes and broccoli) without applying pesticides. Intercropping should include physical barriers, for citronella roots can take over the field. Lemongrass oil, used as a pesticide and preservative, is put on the ancient palm-leaf manuscripts found in India as a preservative. It is used at the Oriental Research Institute Mysore, the French Institute of Pondicherry, the Association for the Preservation of the Saint Thomas Christian Heritage in Kerala, and many other manuscript collections in India. The oil also injects natural fluidity into the brittle palm leaves, and the hydrophobic nature of the oil keeps the manuscripts dry so the text is not lost to decay due to humidity. East Indian lemon grass (Cymbopogon flexuosus), also called Cochin grass or Malabar grass, is native to Cambodia, Vietnam, India, Sri Lanka, Burma, and Thailand, while West Indian lemon grass (Cymbopogon citratus) is native to South Asia and maritime Southeast Asia. While both can be used interchangeably, C. citratus is more suitable for cooking. In India, C. citratus is used both as a medical herb and in perfumes. C. citratus is consumed as a tea for anxiety in Brazilian folk medicine, but a study in humans found no effect. The tea caused a recurrence of contact dermatitis in one case. Lemon grass is also used as an addition to tea, and in preparations such as kadha, which is a traditional herbal brew used against coughs, colds, etc. It has medicinal properties and is used extensively in Ayurvedic medicine. It is supposed to help with relieving cough and nasal congestion. Numerous species now regarded as better suited to other genera including Andropogon, Exotheca, Hyparrhenia, Iseilema, Schizachyrium, and Themeda. ↑ Flora of China Vol. 22 Page 624 香茅属 xiang mao shu Cymbopogon Sprengel, Pl. Min. Cogn. Pug. 2: 14. 1815. ↑ Shadab, Q., Hanif, M. & Chaudhary, F.M. (1992) Antifungal activity by lemongrass essential oils. Pak. J. Sci. Ind. Res. 35, 246-249. ↑ Edmon Agron. "Lemon grass as mosquito repellent - WorldNgayon® | WorldNgayon®". Worldngayon.com. Retrieved 2013-10-17. ↑ Takeguma, Massahiro. "Gowing Citronella". Retrieved 12 June 2013. ↑ Blanco MM, Costa CA, Freire AO, Santos JG, Costa M (March 2009). "Neurobehavioral effect of essential oil of Cymbopogon citratus in mice". Phytomedicine. 16 (2–3): 265–70. doi:10.1016/j.phymed.2007.04.007. PMID 17561386. ↑ Leite JR, Seabra Mde L, Maluf E, et al. (July 1986). "Pharmacology of lemongrass (Cymbopogon citratus Stapf). III. Assessment of eventual toxic, hypnotic and anxiolytic effects on humans". J Ethnopharmacol. 17 (1): 75–83. doi:10.1016/0378-8741(86)90074-7. PMID 2429120. ↑ Bleasel N, Tate B, Rademaker M (August 2002). "Allergic contact dermatitis following exposure to essential oils". Australas. J. Dermatol. 43 (3): 211–3. doi:10.1046/j.1440-0960.2002.00598.x. PMID 12121401. ↑ "Lemongrass Health Benefits And Healing Properties | Ayurvedic Wellness & Lifestyle". Planetwell.com. 2012-04-03. Retrieved 2013-10-17.